The players are all the same, but... everyone seems to be playing different parts. On the way to New Bajor in the Gamma Quadrant Kira and Bashir turn left at the wormhole and... cross over, ending up in a parallel world where their lives, and perhaps universe, are in danger. This episode was a fun and wild ride to a what-if world. If you’ve watched the original Trek episode "Mirror, Mirror" then you know the setup: there’s a parallel universe which (apparently) was once accessible by transporter. Here, Julian and Kira somehow manage to replicate the trip using a runabout and a wormhole, totally by accident. They wind up in another Universe and in so doing provide a sort of sequel to a story begun years earlier in another series. In this Universe, Kira’s dreams have apparently come true. Bajor is powerful. An alternate Kira is likewise powerful and in charge of Deep Space Nine which has never been moved to the wormhole. Sadly enough, Bajor’s power is based on a military alliance wrested from... alternaSpock, who apparently preached peace after meeting Kirk, and wound up leaving the Terran Federation open to conquest. (The best laid plans of voles and Vulcans?) And Kira and Bashir are caught, separated, and in a completely different Universe. What’s a grumpy commander to do? I think this episode works best as a character study. The political intrigue in the other world was a nice backdrop, but I think we all are more interested in how this revised history affects our alternaTeam. Now that Terrans are despised, what does Sisko do? 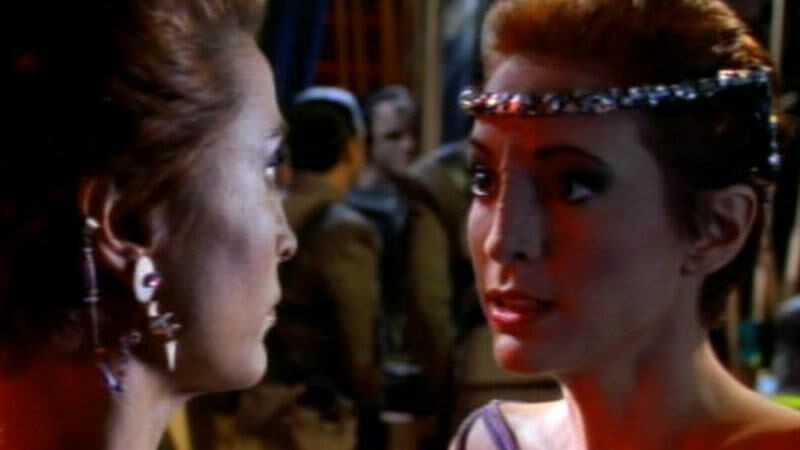 Now that Bajor is in power, what happens to Kira? I think alternaKira and alternO’Brien were the most impactful characters for me. O’Brien is very effective as an Everyman character, an oppressed Terran who is introduced to the idea that another world is possible. Kira, as usual, impacts me the most. Like alternaKira says, she’s used violence but never enjoyed it, often regretted it. The two characters are remarkably similar in some ways and their initial discussion was like an incredible ballet in which the two Kiras finished each others’ ideas. But where our Kira has a solid and dependable team, despite Bajor’s challenged state, the powerful alternaKira is alone and doesn’t have anyone to trust despite her passion for power. This lack pushes her more and more into killing; she puts alternaQuark to death and comes close to killing Bashir. When alternaKira initially meets our Kira, she is so desperate for trust that she immediately opens up, to the surprise and scheming of alternaGarak. When she finds her trust betrayed, alternaKira rejects the notion of not killing and begins expressing the desire for revenge on the Terrans. Our Kira is completely lost in this new world but immediately identifies alternaKira’s power madness and begins playing on it making alternaKira believe our Kira also has the same power madness. She doesn’t give a damn what others think. And alternaSisko shows the same disinclination. I thought this was actually a reference to "Mirror, Mirror," where the characters discuss how the alternate Universe they are trapped in is uncivilized, and how it's easier to be a civilized person pretending to be uncivilized than otherwise. The only shining moments in this world belong to alternaMiles and his dreams of a better world, and alternaQuark, who smuggles out suffering Terrans. In the end it's really the alternaCrew's infighting and 'lack of civilization' which enable Kira and Bashir to escape, get the runabout, and make a desperate bid to return. Back in the real world Kira says they’re through the looking glass. But how long is it before the alternate world realizes our world is still here and ripe for the taking? The opening to this episode is hilarious, from Kira rejecting music to Bashir's huff and puff meditation. But what's interesting is once they're in a complex situation all the guff and gaff disappear, and Bashir and Kira work together like a well-oiled team. Tor Jolan is a Bajoran musician. I loved the name for the station leader, Intendant. Odo slapping Bashir. Kira shoulda watched. But then Odo is killed. Alas. Don't slap Bashir. The Quark scene was awesome. I was like, Action Hero Quark! The logic behind what happened as a result of Mirror, Mirror is something I hotly debate with my peers. Can a philosophy of peace be possible, ever, as long as war exists? I think all the alternas enjoyed the opportunity to be different – and especially Kira. Why is there no Julian Bashir here? I have a feeling there's a reason. Julian: Julian. Go on, say it. Julian. Julian: It was hard for Chief OBrien too at first. We had our problems too but now we’re like this. alternaKira: You have made a career out of making examples, Garak. I think you enjoy it too much. Garak: He's just been arrested. Sisko: Arrested? What a damned shame. Who wants a drink on the house? alternaKira: Quiet. On this side, Terran workers do not speak to their superiors as you do. They certainly do not murder them. He was the only one of his kind, the man you killed. Do you realise that? He's irreplaceable. No one ran that operation as efficiently as he did. No one kept order among the workers as he did. This is my reward for treating you Terrans with the least bit of respect. Very well. I can learn from my mistakes. You want to set an example, Garak? Use him. Set an example for all Terrans. Let him die slowly in public view on the Promenade. Let his pleads for mercy echo through the corridors for all Terrans to hear. alternaKira: Another word from you and you will die right beside him. And you, O'Brien, you tinkerer and putterer and fixer of broken things, you've been a perfect theta for years. What could have possibly gotten into you. What were you thinking? O'Brien: Do you want an answer, Intendant? O'Brien: This man. This man is a doctor where he comes from. And there's an O'Brien there just like me, except he's some kind of high up Chief of Operations. They're Terrans. Can you believe that? Maybe it's a fairy tale he made up, but it made me start thinking how each of us might have turned out if history had been just a little different. I wanted him to take me with him because whatever it's like where he's from, it's got to be better than this. There's got to be something better than this. I kinda loved it. Five out of five bellows breaths. It's been awhile, but I remember really enjoying this one, too. But then again, I think anything related to the "Mirror, Mirror" universe is fun.